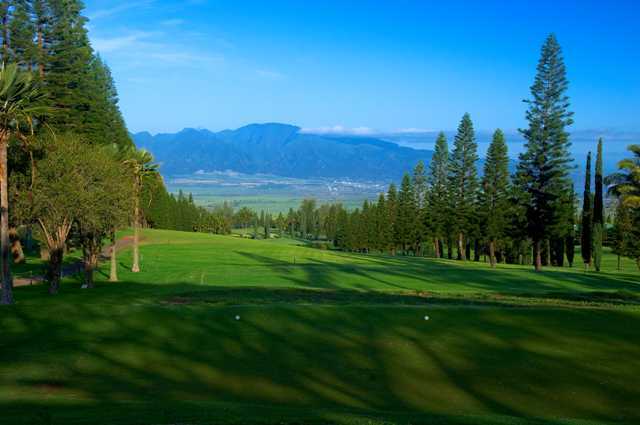 Pukalani Country Club is situated at a 1,100-foot elevation, providing the golf course with spectacular views of the Valley Isle of Maui. The forgiving layout provides golfers with many chances to birdie and there are also plenty of par opportunities, making the course ideal for all skill levels. Pukalani Country Club has a unique location at the 1,100-foot elevation of the famous Mount Haleakala, an extinct volcano whose name means “House of the Rising Sun.” The dramatic elevation offers breathtaking views that span the West Maui Mountains to the Pacific Ocean. The golf course features wide, undulating fairways and fast, sloped greens. The gently rolling terrain can cause some tricky uneven lies. There are trees and well placed bunkers scattered throughout to provide further challenge. Pukalani Country Club has a unique feature on the par-3 third hole. The hole gives golfers the options of hitting to one of two very different greens, one which requires a tee shot over a tree-filled gully and another that requires a shot beyond a cliff to a pal tree-lined green. I played this course whilst on holiday in 1994, it was a great experience and the par3 third with that unbelievable drop was clearly one of the best holes ever (lost 3 balls)? I have been playing Pukalani for 5 years. I first played it because it was the only course on Maui to recognize the Hawaii ID card for resident rates. The people are great and the course is challenging. This year, the poa annua has crept into the greens, making them a little bumpy. I very much enjoy my time spent on the course at Pukalani Country Club. 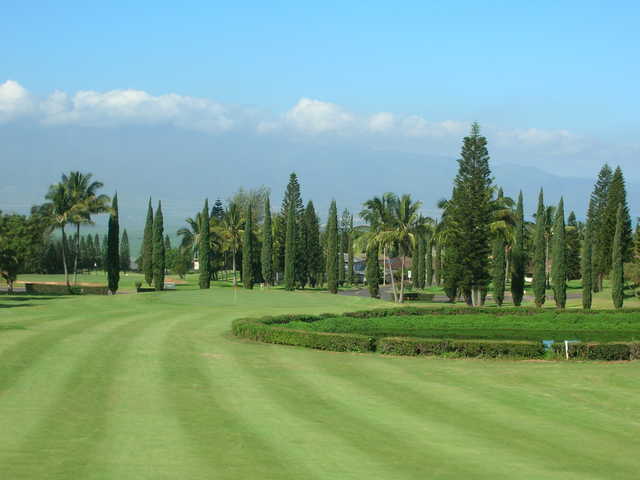 My plan are to visit this great course this year.I have played several courses on Maui and this is my favorite course. The staff is great, helpful and very friendly. I certainly hope Jeff is still there when I visit this year. Looking forward to seeing everyone in November 2012. It's not a bad course, but it's not great either. If your looking for a dream round on Maui then do not play here. The course isn't in that great of shape, the clubhouse is a shack(there is a good reason for that, but it is too long to explain why), distance between some holes is way too far, and some of the things you'll see may not be that plesant like seeing ducks with arrows through their chests and hearing children getting abused in nearby homes. However the course is very challenging though, offers up some great views, and the staff is extremely friendly. Best deal on the island. Staff is very friendly. Views are awesome. Welcoming to visitors. Reasonable packages available for multiple rounds during your vacation. I played it 6 times on my last visit, and they greeted me by name on my second trip to the course. I generally am playing alone when on Maui, but I got matched with some nice people. You will see more locals here, they are smart enough to avoid the outrageous prices at the resort courses.